The theatre was built on the site of a wheelwright's shop on Salway Road, close to the junction with Angel Lane, designed by architect James George Buckle, who was commissioned by the actor-manager Charles Dillon (formerly Silver, the son of Charles Dillon) in 1884. It opened on 17 December 1884 with a revival of Richelieu by Edward Bulwer-Lytton. Two years later, Dillon sold it to Albert O'Leary Fredericks, his sister's brother-in-law and one of the original backers of the scheme. Side extensions were added in 1887, and the stage enlarged in 1891, by the original architect. In 1902, Frank Matcham undertook minor improvements to the entrance and foyer. The Fredericks family continued to manage the theatre until 1932, although after the World War I, the theatre fell into financial difficulties, opening only irregularly after 1926. About 1950, a touring company presented the Christmas pantomime, Alice in Wonderland. The company were to return, as the Theatre Workshop in 1953, with artistic director Joan Littlewood and take over the theatre. The theatre came under threat with the construction of the Stratford shopping centre in the 1970s, but was saved by a public campaign and protected in June 1972 by English Heritage with a Grade II* listing. Money remained short, and the manager, Gerry Raffles only managed redecoration and replacements as cash became available. In 1984, the front of house was refurbished and in 2001, following a successful Heritage Lottery Fund bid, it completed the redevelopment of all of its front of house and backstage areas as part of a project to create the Stratford Cultural Quarter. In 2005 the Theatre Royal Stratford East made history by having the first British Black musical to transfer to London's West End, where it played at the Apollo Theatre. Recently the theatre produced a musical version of the cult Jamaican film The Harder They Come. This production was written by the film director Perry Henzel and was one of the most successful productions in the theatre's history. In June 2011, Olympic news outlet Around the Rings reported that the Nigeria Olympic Committee had chosen Theatre Royal Stratford East as its hospitality house for the 2012 Olympic Games. The Hackney Empire is a theatre on Mare Street, in the London Borough of Hackney, built in 1901 as a music hall. Hackney Empire is a grade II* listed building. 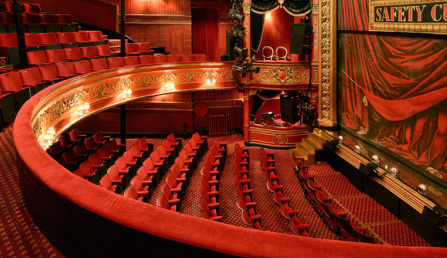 The theatre was built as a music hall in 1901, designed by the architect Frank Matcham. Charlie Chaplin, WC Fields, Stanley Holloway, Stan Laurel and Marie Lloyd all performed there, when the Hackney Empire was a music hall. ATV bought the theatre to use as studios in the 1950s, and shows such as Take Your Pick and Oh, Boy! were broadcast live. Certain episodes of Opportunity Knocks were also filmed at the theatre. Some scenes from Emergency - Ward 10 were also filmed there. From 1963 to 1984 the theatre was used by the Mecca Organisation as a bingo hall. In 1984, Mecca found the building too expensive to maintain as a bingo hall, and it was offered to C.A.S.T, a satirical touring theatre group, headed by Claire and Roland Muldoon, as a London base. They also mounted successful variety nights headlined by a new breed of alternative comedy acts, such as Ben Elton, Dawn French, and Jennifer Saunders. The theatre was threatened with demolition, and in 1986, actor-manager Roland Muldoon mounted a campaign to acquire the freehold and to re-open the Hackney Empire as a permanent performance space; allowing the theatre to return to theatrical use for its 85th anniversary. Ralph Fiennes played Hamlet to Francesca Annis's Gertrude in Jonathan Kent's Almeida Theatre Company production of Hamlet, 28 February – 30 March 1995; the production also transferred to the Belasco Theatre in New York. Muldoon retired in 2005 and was replaced by Simon Thomsett as chief executive. On 24 September 2009, it was announced that the theatre would close temporarily following its 2009 pantomime to allow a "period of reflection" to consider its future direction and financial position. Hackney Empire was a leading centre in the alternative comedy boom of the 1980s - Ben Elton, Dawn French, Jennifer Saunders, Jeremy Hardy, Mark Steel, Arthur Smith, Jo Brand, Harry Hill,Paul Merton, Harry Enfield, Lenny Henry, Felix Dexter, Tim Vine, Mark Linn-Baker, Greg Davies, Russell Brand, Jackie Clune, Frankie Boyle, John Cleese, Martha Lewis and Eve Polycarpo have all performed there, amongst many others. Arthur Smith hosts the important annual Hackney Empire New Act of the Year competition for up and coming stand-up comedy talent. In 2001, the Empire closed for a £17 million refurbishment project designed by Tim Ronald’s Architects with Carr and Angier acting as theatre consultants. It was reopened in 2004. The restoration included the addition of a 60-seat orchestra pit to make the Empire suitable for opera performance by companies such as English Touring Opera, the addition of a fly tower with provision for counterweight flying and a reduction of the stage rake from 1 in 24 to 1 in 30. Among other new facilities were a studio theatre and educational and hospitality facilities, and greatly improved dressing rooms. Additionally the Marie Lloyd public house was incorporated into the new extension. In addition to Muldoon, the comedian Griff Rhys Jones led the restoration appeal, with a large donation coming from local businessman Sir Alan Sugar. It has produced an enormously successful and highly regarded panto since 1988.